My thanks to the author for giving me a review copy in exchange for an honest review. Witnessing a dramatic death at London’s Waterloo Station triggers a series of events that shatter Eva Scott’s world. Dying words uttered on the station concourse awaken a history she had thought long buried. But the past is about to be resurrected, in all its brutal reality. Soon, Eva’s life is out of her hands. A genetic key is keeping her alive; but foreshadowing her death. People she loved and lost materialise and then disappear, testing the limits of her sanity. Inextricably linked to her survival is the potential takedown of an economic power, on which hang the lives of many others. The only way out is through. But Eva’s life is no longer her own. And it’s killing her. I’m writing this review after just finishing Killing Eva and yet I still don’t know where to begin! This book is pretty fast paced, more action thriller than crime book. It’s perfect for fans of Terry Hayes (I Am Pilgrim). Killing Eva is a strange book to try and review, as it doesn’t fall into a clear cut genre as such. It’s definitely full of action, but it has a biomedical theme along with financial terrorism being mentioned also. The book has peaks and troughs throughout. When it’s full of action, you find your heart beating quicker and your fingers itching to turn the page to see what is going to happen. However, the troughs were quite slow by comparison. I also found the constant switching between groups of individuals and main characters to be quite confusing. 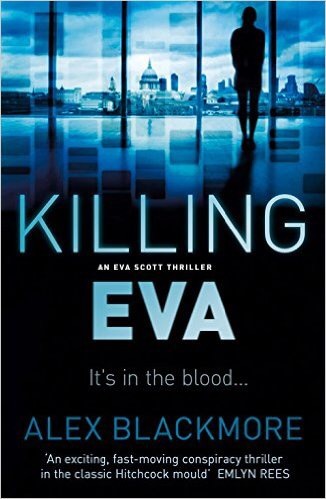 Killing Eva, in essence, is a good thriller. Parts of it were brilliant, but some parts just left me wanting. I felt like I was missing something sometimes. The ending was also quite abrupt, could be classed as a cliffhanger, but it just stopped in the middle of something! I hate to criticise a book, as what didn’t work for me doesn’t mean others didn’t enjoy it. Killing Eva was a decent read, and I gave it 3 stars on Goodreads. Previous Previous post: My Top Ten Books & Series of 2015 Part 2!! !